Happy New Year everyone! With the start of a new calendar year, comes the promise of exciting places to visit. Southern Taiwan will be given a special focus this 2017. It is an exotic land on the western side of Taiwan and located below the Tropic of Cancer. The weather is milder here compared to Taipei’s chilly atmosphere during winter. Chiayi, Tainan, Kaohsiung and Pingtung. 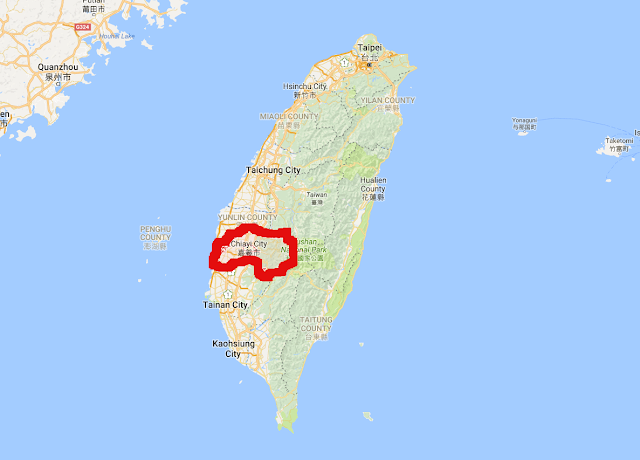 These are the four provinces that made up Southern Taiwan. Are you ready to explore to know what they can offer? Let’s start first with Chiayi. The land of pineapples, baseball lovers and a forest railway takes the center stage in my first travel special for 2017. My 30% discounted THSR ticket for my Nangang to Chiayi trip. How to get to Chiayi? The easiest and fastest way to get here is to board the Taiwan High Speed Rail (THSR). The Japan-made bullet train of Taiwan traverses the western side of the island from Nangang District in Taipei to Kaohsiung in the south of Taiwan. As a student here, I have the privilege to get THSR ticket discounts for up to 50% for certain departure times which are distributed in different days. I was lucky to received a 30% discount on New Year’s Day. Instead of paying NTD 1120 for my Nangang-Chiayi ticket, I only paid NTD 780. Great! The travel time from Nangang to Chiayi was almost two hours and I slept during the whole trip because I still don’t have enough rest from the New Year’s countdown party in Taipei 101. It was my first time to ride the THSR on a holiday season and I was surprised that the train became full in an instant at Taipei Main Station. I arrived in THSR Chiayi Station at 8:54 am. Go to Exit 2 and find this two waiting sheds with the BRT sign. The back design of the waiting sheds feature the different tourist attractions in Chiayi. Bus 7212's terminal stop is the TRA Chiayi Station while Bus 7211 will continue to transport people up to Chiayi Park. If you are going to Chiayi City look for the waiting shed with the sign "To Chiayi". Bus 7211 as it arrives in THSR Chiayi Station. My train left Nangang at 7:00 am and I arrived in THSR Chiayi Station at 8:54 am. I had difficulty searching for the shuttle bus going to Chiayi TRA Station until a kind man pointed his finger towards the two bus stops with the BRT sign on top. Buses 7211 and 7212 takes passengers to Chiayi Station where local trains and express trains there transport people to the different places in Southern Taiwan even up to the mountains in the Alishan scenic area. I rode Bus 7211 and it was a low-floor vehicle. People follow the queue to enter and those presenting their THSR tickets to the driver gets a free ride. Just make sure that the bus is going to Chiayi Station or you might find yourself in Chiayi County Stadium. The TRA Chiayi Rear Station also functions as a bus station. To get to the Front Station, I climbed the stairs and walked over a footbridge. Japanese-style houses near Chiayi Station. The footbridge connecting the front and rear side of Chiayi Station. Bus 7211 made a stop at the back of Chiayi Station which is officially known as the Rear Station. A footbridge connects the Rear Station to the Front Station. As I walked along the bridge, I noticed the wooden love padlocks hanging on its side. There were Chinese writings on the padlocks and it could be names of the couple who made a pledge for an everlasting love. I made a stop in the middle of my walk to take a photograph of the railroad tracks and there was this sense of nostalgia as I looked at the view. It reminded me of the busy days of Chiayi during Taiwan’s Japanese colonial period. After getting off the footbridge. The interior of Chiayi Station. I went to the Visitor Information Center to gather some English maps and asked some questions. The bus station is just ouside the train station. Inside the bus station. Most of the passengers here were waiting for the bus going to Alishan. The Taiwan Tour Bus also stops here. Arched windows characterized the main Chiayi Station. Since it was first time in Chiayi, I searched first for the Visitor Information Center whether I collected free maps. I also asked the staff on which bus should I ride to visit the most beautiful university in Taiwan. I followed the instructions that were given to me until I found myself in the Chiayi Bus Station which was just beside the train Station. I waited for Bus 7309 and at 11:00 am it left the station towards the direction of Minxiong Township. I looked outside the window and I got excited as the bus passed along the different tourist attractions in the city. Yeah! Great things are about to happen in 2017 and it will all begin in Chiayi.